The ticket selector (pricing option selector) in Event Espresso allows you to present multiple ticket options to registrants so they can choose the registration options that will best fit their needs. Optionally show the details of a single ticket including the: ticket description, ticket sale start and end dates and times (datetimes), access to which datetimes are available, and number of datetime uses. With Event Espresso 4, each pricing option that you create will show in the ticket selector (pricing option selector). A pricing option (e.g. a ticket) is always displayed (unless deleted) so that attendees/registrants become aware of the pricing options. However, each ticket will only become available for purchase when the ticket conditions (e.g. date and time) are met. You can offer multiple types of tickets for any event. You can also do great things like Graduated Pricing or Ticket Bundles. 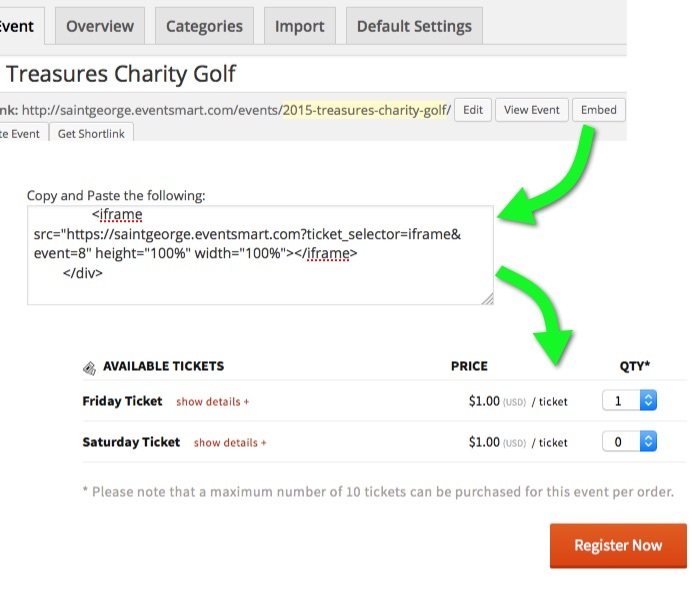 The Ticket Selector Embed Code feature allows you, or anyone with the embed code to display a ticket selector, for your events, on a different websites HTML page, Facebook page, WordPress.com and/or WordPress.org posts and pages. The ticket configuration options are very powerful and flexible to accommodate many ticket options. Each ticket can have a possible of four statuses, based on the ticket conditions (e.g. number of tickets available, start and end datetimes, event datetime capacity limits, etc.). The front-end ticket statuses are: “Available”, “Expired”, “Not Available”, “Sold Out”, and “Goes on Sale [date]”. Ticket Quantity: there are ticket quantities available for sale. Event Datetime Limit (capacity): the event datetime has not reached capacity. Goes on Sale: date and time (datetime) has occurred. Sell Until: date and time (datetime) has not yet occurred. Sell Until: date and time (datetime) HAS occurred/passed. Event Datetime Limit (capacity): the event datetime has less capacity than a ticket requires. The Min or Max ticket Quantities can not be met, e.g. a minimum purchase of 10 tickets is required, but there are only 8 available. Ticket Quantity: there are NOT ticket quantities available for sale, OR see Event Datetime Limit. Event Datetime Limit (capacity): the event datetime has/has not reached capacity. Goes on Sale: date and time (datetime) has NOT yet occurred. You have the ability to educate your customers in great detail about a ticket (if you want). The ticket description can give a sales pitch about a ticket or just explain logistics. Some HTML characters are allowed in the description field. The individual tickets have separate “Goes On Sale” and “Sale Ends”. When the event “Goes On Sale” datetime occurs, the ticket becomes available for sale. When the “Sale Ends” datetime occurs, the ticket becomes “Expired”. Rather than purchasing multiple tickets for several different occurrences of an event, the event manager can configure each ticket to have the capability to access many dates and times (datetimes) for a single event. Even though a ticket has the potential to access multiple date times (see Event Access just above), an event manager may only want to allow the ticket to be used a certain number of times among all the possible options. For example, a yoga ticket might have access to 10 different class datetimes, but the instructor might only sell a five-session pass. The ticket has the rights to access all 10 classes, but it can only be used a total of five times for any of the 10 sessions. As part of the event configuration, the event manager can decide how many tickets they will allow to be purchased in one order. For example, you may only want to allow attendees to purchase four tickets to the event so that many different people can attend. This can be changed in the event editor > “Event Registration Options”.